In 2017 ATD Fourth World invited activists, community leaders and regular citizens to document real life Stories of Change about situations of injustice and exclusion caused by extreme poverty. These stories show that when people work together, real change can happen. Ang Galing!, a Tagalog expression, means “Wow!” or “Well done!”. It is used in recognition, as an encouragement for the work someone has done. 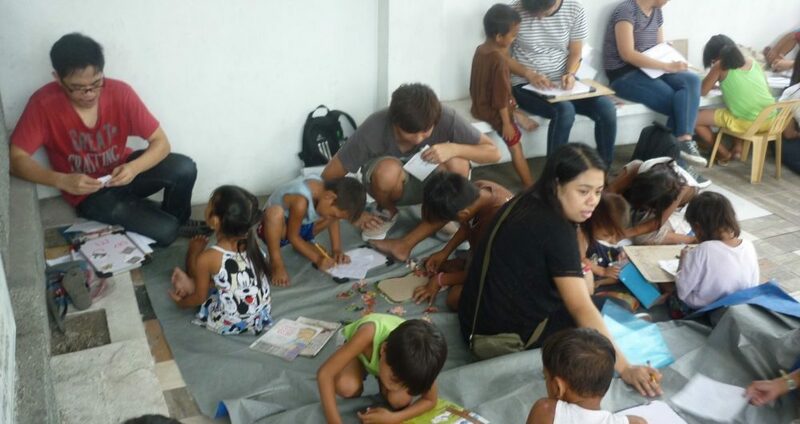 It is also the name given to the school support program led by ATD Fourth World at the Manila North Cemetery in the Philippines where thousands of families live. Every Saturday, girls and boys meet there in a mausoleum to work individually with an adult volunteer to catch up with reading and writing. This project started in 2012 with twenty children and four adults. With the help of the ATD Fourth World communications team in Manila, and through social networks and new partnerships with schools, from the 2014-2015 term, each child was supported by one adult. This individual attention was necessary because each child was at a different level of learning. Starting from the individual needs of the child and not the curriculum or the teacher is one of the important principles of Ang Galing! At the end of the program, ATD Fourth World awards a diploma to most of the participating children, showing the level of reading and writing the child achieved. Romeo lives with his family at the North Cemetery. He attended school for three years, but did not continue. His relationship with other members of the community was not easy. Many people ostracized him and said he was mentally disabled. He began participating in Ang Galing! in 2013. At first, he only came occasionally and did not stay long. However, the educational games the volunteers use gradually brought him into the program, and he began to attend regularly every Saturday. Let’s Go to Ang Galing! This did not fall on deaf ears, and Romeo asked his mother to re-enroll him in school despite his three-year absence. His mother hesitated because of the cost. Romeo, very determined, went to the school alone to speak with the headmaster, who invited him to come back with his mother — which they did the following day! Romeo succeeded in being registered but first he had to sign a paper informing him that if his attendance was not good enough, he would be expelled. This put great pressure on his mother, but she took it as a second chance. Most of the time, after graduating, children do not come back to Ang Galing! but leave their place to others. Romeo, however, came back to show the adults that he still knew how to read. Romeo also developed other skills through the program. When a journalist came to do a documentary on Ang Galing!, he confidently told her all about the program. This is not only one child’s success; it also reflects a change in the community. Before, it was normal for the children of the North Cemetery not to go to school. But gradually, for both parents and children, the way they now look upon school has changed.